Christians are the huddled, persecuted masses, yearning to breathe free—or so they would have us believe. After all, in the last few years a lot of folks have been ganging up on them. Gay people who want wedding cakes come to mind, but, more seriously, Sam Harris, Christopher Hitchens and Richard Dawkins scorched Christianity with their bestselling atheist books—and these turned out to be just the tip of the iceberg. And then, of all things, a few scholars grabbed headlines with the suggestion that Jesus might not even have existed; they have published substantial works to make their case that a real Jesus is, well, iffy. Yes or no? Well, are you ready for some homework? 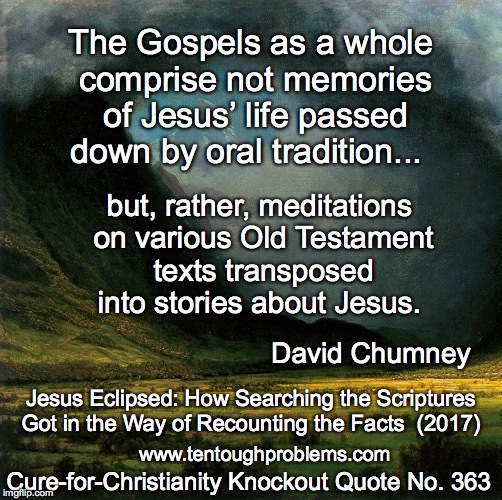 The debate on the historicity of Jesus is not about to go away, and we now welcome a recent book on the topic by David Chumney, Jesus Eclipsed: How Searching the Scriptures Got in the Way of Recounting the Facts (April 2017). Christian apologists who fear that this is yet another book championing Mythicism may draw some comfort from Chumney’s title, Jesus Eclipsed. No, Chumney argues, Jesus cannot be scrapped, but he is in fact obscured by the very documents that Christians regard as the holiest texts imaginable. In his chapter, “On the Shoulders of Giants” he recounts past scholarship that shows how weak the gospels are: as soon as the methods of historical criticism were brought to bear on the New Testament, the case for the historical Jesus began to erode. Naturally the church balked and ignored this bad news; there probably has been no Sunday School or catechism class on the planet in which the critical study of Jesus has been part of the syllabus—at least without apologetic spin. “Those who know only what the church has told them about Jesus may be shocked to discover that an institution that has assimilated Copernicus and Darwin continues to stumble over Strauss.” Who? Most Christians might assume that Strauss was the guy who wrote waltzes. No, wrong Strauss. Chumney provides a handy introduction to the German scholar David Strauss (1808-1874), who wrecked his career for writing critically about Jesus. Nonetheless he created a platform for later scholars to build on. Strauss didn’t claim that Jesus never existed—that wasn’t his agenda at all—rather he wanted Bible scholars to use their heads and common sense—and the tools of the historian—as they studied the gospels to figure out what really happened. The vexing problem of the apostle Paul’s silence about Jesus is the topic of Chapter 4. Scholars have been stumped by this for a long time, and Chumney points out that Paul’s writings reflect theology that developed after Jesus was dead and gone. Paul’s silence may not be proof positive that Jesus was a fictional character, but Paul seems totally unaware of the Jesus stories and teachings that ended up in the gospels. So much for the oral tradition that was supposed to have been floating around. The fanatical apostle was far more interested in theology than history. Those laypeople who are curious enough to read the gospels—really read them—notice goofs and errors, and Chumney’s Chapter 5 sheds light on these: “Traditions with little if any historical value appear on every page.” He discusses factual mistakes, anachronisms, contradictions, and miracles (“not the stuff of history”) that can be defended only with special pleading. He sees Jesus as a figure who really did live in first century Palestine, but “the countless stories associating him with the miraculous or the supernatural have no claim to historical reliability; in every case they are pious fiction.” Laypeople should take this message to heart. Many of those stained glass panels can be removed. Chumney’s summary is a much-appreciated call for further study of the Jesus question—but one that avoids the mistakes that have undermined the field, mistakes committed by those who try to rescue Jesus and those who see only a mythical figure. But, honestly, so much of the error in this field has been committed by the scholars who belong to the community of faith. As a good start for a new beginning, Chumney suggests: “Let us…find four agnostic experts with the appropriate credentials and provide them with a year-long sabbatical…the consensus document that this group would hammer out would focus on the surviving evidence and would limit any necessary inferences to what the group deemed probable.” Agnostic…surviving evidence…probable. Now, about those millions of copies of Chumney’s book in thousands of pews. We could select a hundred random Christians and pose the question, “What is your opinion of the turmoil in Jesus studies for the last few decades?” It’s a good bet that 99 of them would have no clue what that means; they do not realize that New Testament studies have been in upheaval, as scholars try to extract the “true” bits and pieces about Jesus in the gospels—with so little success. 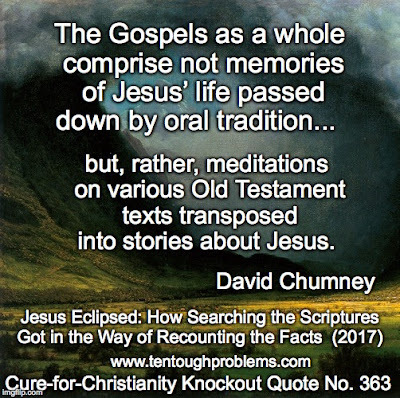 Chumney’s footnotes and bibliography are the tools for laypeople to bypass pastors, priests and oceans of devotional literature, to dip their toes in the waters of authentic Jesus studies. “I have repudiated the doctrines of the Christian faith,” Chumney states at the beginning of the book, “but I have not forgotten what I discovered over the years about the Bible, particularly the Gospels.” From his perspective now, outside the Christian faith, he invites the reader to look at the gospels shrewdly and skeptically—and begin the adventure of discovering that the real Jesus—whoever he might have been—is lost in the gospel fog. David Madison was a pastor in the Methodist Church for nine years, and has a PhD in Biblical Studies from Boston University. His book Ten Tough Problems in Christian Thought and Belief: a Minister-Turned-Atheist Shows Why You Should Ditch the Faith, was published last year by Tellectual Press.